The fruits of the weak rupee should be visible in the earnings of IT companies in the December quarter. Kotak Institutional Equities estimates earnings of Tata Consultancy Services Ltd (TCS) to rise 26%. The company will report its earnings for the third quarter (Q3) on Thursday. TCS is expected to benefit from the recovery in growth rates in key business verticals, operating efficiencies and rupee depreciation. Infosys Ltd, which is slated to release its earnings on Friday, is projected to report the weakest profit growth among large companies. Its earnings are estimated to grow a mere 9%, weighed down by higher employee expenses and investments in sales. The company has been battling high attrition, and had to dole out incentives and bonuses to try and arrest the trend. However, by and large, IT firms are expected to gain. Besides, though the macroeconomic situation remains volatile, they had won large deals, which should aid volume growth in the near term. In the December quarter in particular, volumes tend to be a bit sluggish when compared sequentially, given furloughs at clients. 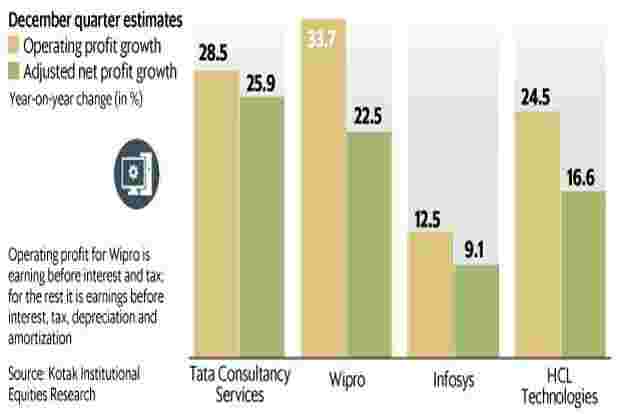 Even so, considering the large deal wins, analysts are baking in sequential revenue growth of 1.8% for TCS.